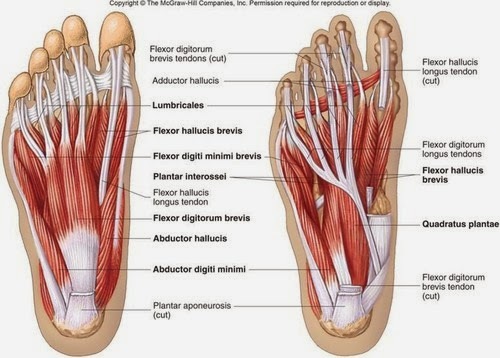 I had no idea that there were so many muscles in our feet! It is no wonder mine hurt so bad after a going for a run. I’ve been trying to stretch before and after, but I haven’t heard of the “short-foot exercise” before. Before my next run, I’ll be sure to give it a try. Thanks for the reply. It’s very easy to ignore the feet but it’s only every single step that we need them to work well. I find the short-foot drill especially tough on the brain. It’s a difficult skill to figure out how to contract and control those muscles. Am I correct in believing that the short foot exercise is primarily an isometric exercise ? If so I can see why the exercise would help strengthening the intrinsic muscles of the foot as they are used during midstance but wonder if there would be any carry over of performance gain during late stance when the toes are in a more dorsiflexed position and the intrinsics in a more lengthened position . Good question. When I do the short foot exercise there is some movement–but not much. (Maybe it’s a quasi-isometric?) Maybe the best way to get some transfer to the position you mention is to try the short-foot drill in that position. I would imagine there would be very little movement. Maybe to get even more transfer we might hold the short-foot position while we executed ankle dorsiflexion and plantarflexion. Seems like we would get some eccentric work to the intrinsics that way. Personally, I sometimes think of grabbing the ground while I run. I think of grabbing a bunch of dirt. So I think I’m doing the short-foot drill while in motion. Kyle ,I recently read a paper (1) which reported that the plantar fascia is under the greatest strain during push-off . Perhaps that is why some suffers of plantar fasciitis report pain during this phase of gait . If the short foot exercise is primarily an isometric exercise then perhaps some additional strengthening of the plantar intrinsics to assist the fascia whilst the toes are in a dorsiflexed position might be a good idea . Your reasoning sounds very accurate to me. If we think about the SAID principle then we should be looking to create strength in the exact positions in which we need it. Putting the toes in dorsiflexion while doing the short-foot drill seems 100% the right idea. Kyle – Great video. I find when doing the short foot exercise that I get a lot of pain in my outside ankle. 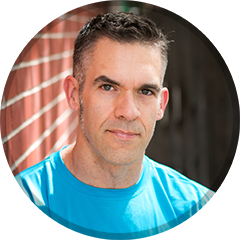 Maybe I’m using the wrong muscles – or maybe I just have weak ankles and really need to do this exercise more! Thanks for the comment and I’m sorry to hear your ankle bothers you when you do the short foot drill. I can’t be certain at all but could it be some sort of intense stretch that you’re feeling? If it continues to be a problem then I suggest seeing a physical therapist, podiatrist, chiropractor or some sort of injury rehab professional. In my opinion there are 2 windlass phase during gait ,the initial windlass phase and the second windlass phase . These are explained in the link provided at the end of this post . The initial windlass phase ,which begins with dorsiflexing of the toes prior to foot contact , is important in avoiding excessive strain in the plantar fascia . Since the short foot exercise is primarily a neuromuscular exercise I believe it should be avoided until its effects on the functioning of the initial windlass mechanism can be established . At the end of this post is a link to a video of Haile Gebrselassie running barefoot which clearly shows the lifting of the toes prior to foot strike . When the foot lands on the ground the fascia ,which is wrapped around the MTFJ , can be paid out by the eccentrically contracting toe dorsiflexors . This mechanism , which is a bit like the arrestor cable on an aircraft carrier , allows the strain within plantar fascia to be controlled , preventing overloading . If a person wears shoes which restrict the lifting of the toes during walking or running , then the toe dorsiflexors have to work harder perhaps leading to shin splints . The solution to this problem ,then , might be as simple as buying shoes with a woven , easy to displace , fabric covering at the front of the shoe so that the toes can easily “lift ” . Haile Gebrselassie slowmotion left barefoot. Light Feet Running / Le Guide du Crawl Moderne. Loading .